Having adequate and safe play space is critical for students to lead active and healthy lives. Play with Potential REC Coordinator Hassan Chaudhry shares his recess experience at Castellanos Elementary. At the beginning of the school year, students at Rosario Castellanos Elementary, in the city’s Little Village community were unfortunately restricted to enjoy Play with Potential recess in an empty parking lot connected to the school. The space was limited in size and that meant limited options for games and activities. Students designated an area for soccer, another for the many fun versions of tag, one for hula hoops and jump rope and another for a portable basketball hoop that needed to be rolled out at the beginning of every recess and rolled back in at the end. 4th and 5th graders used their creative imaginations to make the most of the simple play space. 6th, 7th and 8th graders settled for basketball, volleyball, and soccer, where the majority of the students would try their best to stay active during their 20 minutes of recess. I’d spend most of my recess encouraging the older students to walk around and be active, but that required them dodging various soccer balls and basketballs that inevitably flew overhead. 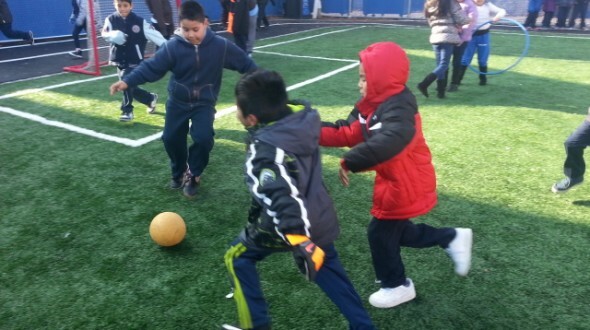 Towards the middle of November, with great anticipation, Castellanos was able to open their new field and play space. This much larger area includes an astro-turf soccer field, permanent half court basketball hoop, larger blacktop area, and a track that encircles the entire area. On the first day we were able to use the new area students couldn’t contain their excitement as they rushed the field and court, eager to play. With this new area, its exciting to see how much more active and engaged our students are, especially the higher grades. Students from 6th, 7th, and 8th grade who would normally stand to the side and watch, are now engaged in various activities. One of the most exciting moments was when a group of 7th grade girls, who normally wouldn’t participate in recess, spent the entire recess period power-walking around the track while inviting and encouraging other students to exercise with them. 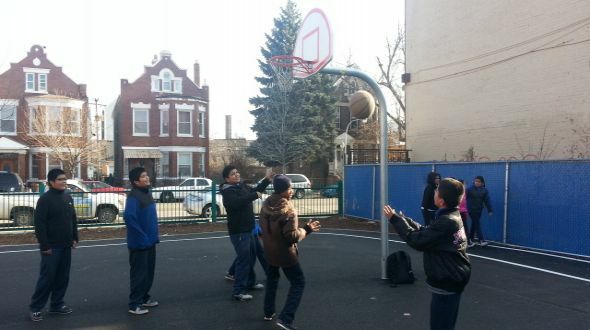 As this play space is being used more often, students are becoming more active and healthy. 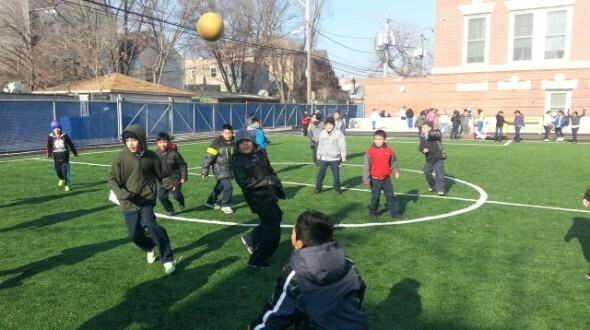 This play space has benefited the students of Castellanos immensely.